Learning from mistakes makes you getting smarter. Moreover, if existing errors coming from the professionals expert. IT professionals can get caught on tricks of cyber criminals. However, from there they can share useful lessons for all computer users. CnwinTech ask some leading IT experts about their experiences while connecting to Internet. Their experience could be valuable lessons for Internet users. 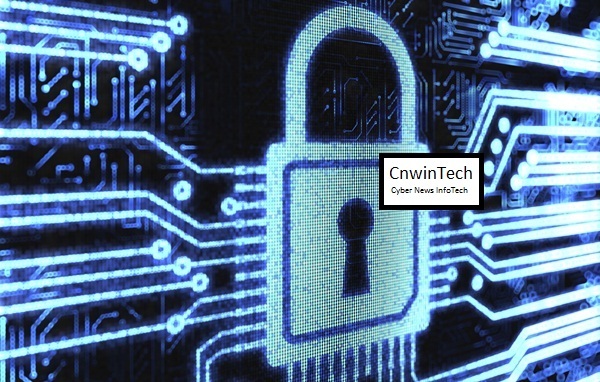 CnwinTech does not expecting get so many honest answers and some very open. Eugene Kaspersky tells how he succeeded in thwart the kidnapping of his son. 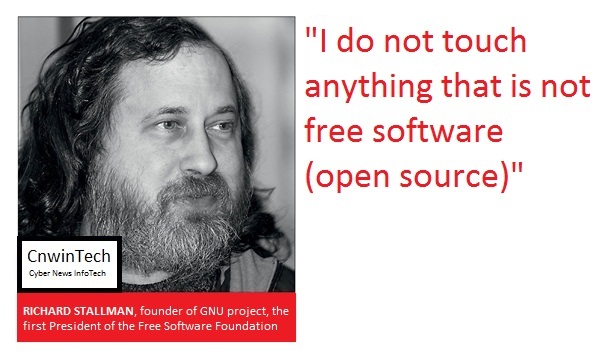 Figure of open source, Richard Stallman also expressed his personal opinion about some errors in Windows operating system. Actually, anyone can implement its own principles in securing data. However, the experience of the experts may also be a personal safety guide. April 2011 ago while a married couple retired Russian kidnap his son, 20-year-old Ivan. To free his son, Eugene Kaspersky with police setting up a hoax. Utilizing the local media, Eugene Kaspersky maneuver distracted the kidnappers by informed that he had paid a ransom of three million Euros. Hoax was successful and further police make action to liberate Ivan without injury. 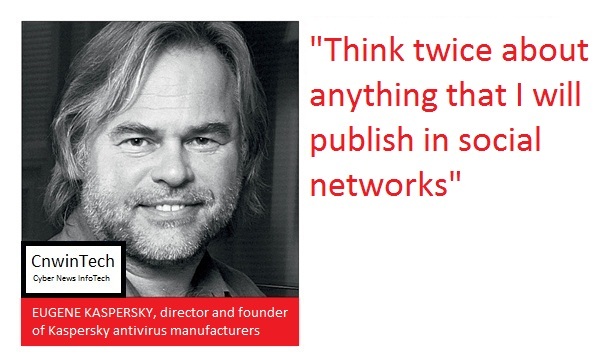 However, these events brings its own lessons to Eugene Kaspersky. The investigation revealed that the perpetrators collecting personal information from social networks and observing daily activities of potential victims. With this information, they planned criminal. “No one knows exactly the reason they chose Ivan as a victim,” said Eugene Kaspersky in a special interview with CnwinTech. “However, I suspect because Ivan publish too much personal information on Vkontakte (Russian Facebook),” he added. With that information, kidnappers can easily find out detailed activities of Ivan, watching, and calculate the level of personal security. With the case, Eugene Kaspersky today still feel guilty since he did not explain the dangers of using social networking and do not give advice to restrict the publication of personal data. “Do not make the same mistake. Act immediately to protect your children”, he warned. Cyber criminals can also be trapped. When Thorsten Holz see better control server of a network bot for research purposes, he did not believe he was seeing. Bot network administrator does not change the default password server. Thus, the researchers were able to copy and analyze the huge numbers digital loot. 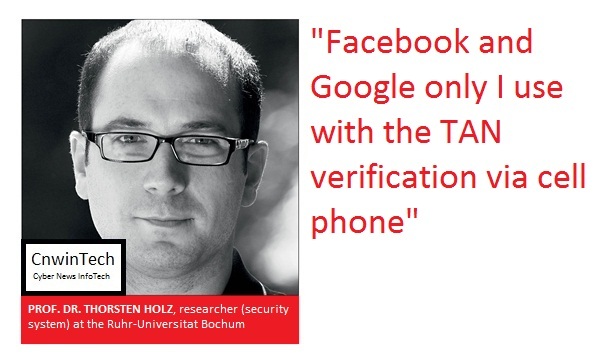 “With the verification of two factors, the network must be more secure (from us)”, says Thorsten Holz. In addition to the password, the user must enter a TAN which will be received on mobile phones via SMS or TAN-apps. Login is just using your username and password hacker easier. With a trojan keylogger, hackers can read any password easily. Currently, Google and Facebook have provided two-factor login. Finnish men began a career as a creator of virus. When teenager, Mikko Hypponen make Omega virus which he said is not dangerous. However, he quickly turned toward becoming a major virus hunters at F-Secure and consultants of international security institutions. Since the 90’s, cyber crime is a billion-dollar business and virus makers likes to targeting community. From there, Mikko Hypponen draw lessons, a program whose name is not familiar (not known) rarely get into the target criminals. 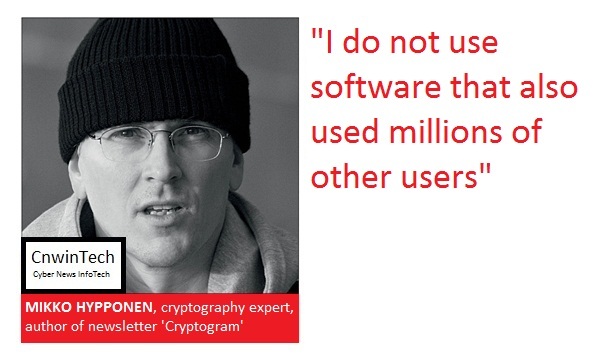 “Use another program,” Mikko Hypponen advice. There are many alternatives, like Linux replacement for Windows 7, Foxit Reader replacement Acrobat Reader, or IE replacement Opera. Bruce Schneier store data in two brains. Laptop containing e-mails, contacts, and agenda, it’s easy to hijacked. “Backup in my brain,” joked Bruce Schneier. However, this is true because if your life a lot going on computer, data leakage will be more easily happen. With distributed backups across multiple storage media, data security will be more preserved. 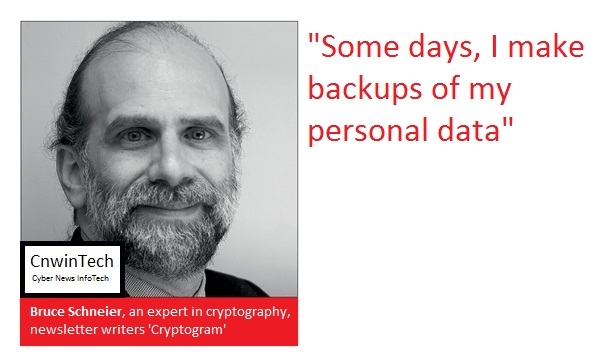 “Always make backups!” Bruce Schneier said. 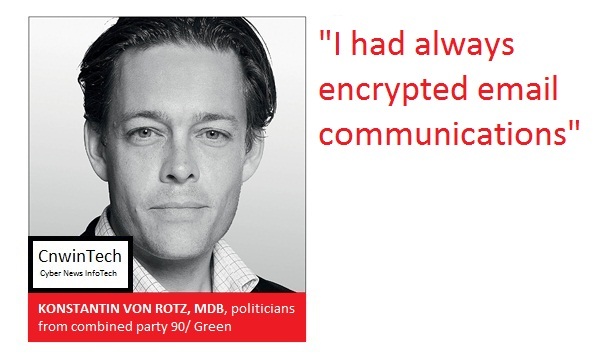 Konstantin von Notz, one of the Green party politicians in the state of Schleswig, Holstein, Germany, fighting for security e-mail as connection between the community and board members via e-mail that encrypted and providing a free application to open it. E-mail encryption is always discussed within the community. Communication without encryption is not compatible with data protection. E-mail without encryption can be read by anyone in the network. Children are a favorite target of ID thieves. 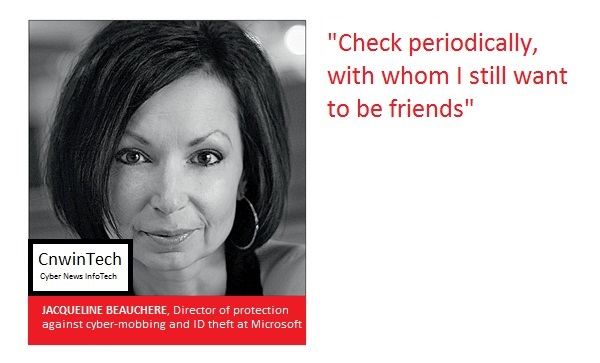 Jacqueline Beauchere, Microsoft security experts found several cases of ID theft on behalf of children who can make many losses. With a social insurance number, criminals get credit for shopping. Losses borne by parents of course. Therefore, Jacqueline advises young parents to make online security an family theme. You have to explain certain restrictions, including checking list of Facebook friends on a regular basis. This must be done because the case has been common, the best friend today could be the main enemy in the next day. Digital clean-up on a regular basis can prevent cyber-mobbing. “The end of school year or when changing schools is a good time to do it,” said Jacqueline. “Check your list of friends on social networks with your child and remove any of some can be dangerous,” she said. 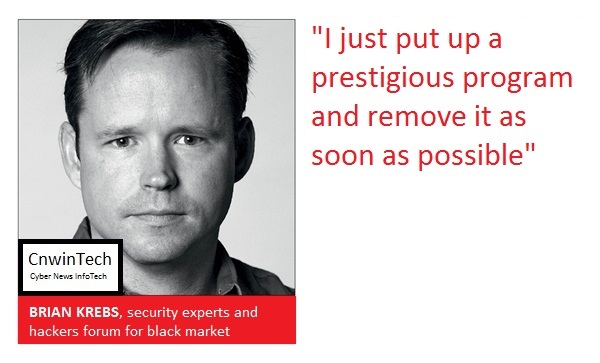 Brian Krebs has learned from bad experiences. “Internet is good, but with good control as well”, said Brian. Several years ago a hacker wrote to him: “Hi Brian, look at this link”. He not only saw, but clicking on it. After that, the operating system is destroyed. For hours he tried to make computer work again. Since then, this security experts separate work environment from external communication. “You never know who sent people through Internet, even by friends though. They can send malware”. Now, Brian Krebs much more cautious. “I only install programs that I know and I really want,” added Brian. Overcoming the problem at its root is the principle of Joanna Rutkowska. For her, a computer security should start from hardware. “During this operating system uses too few hardware technologies that can further improve computer security,” she said. 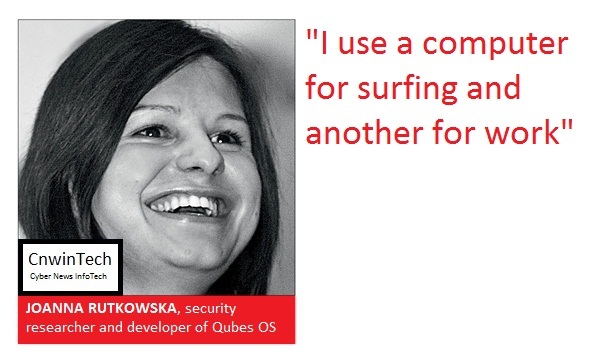 This Polish security researcher has argued like that because with their team Invisible Things Lab, she has been working on open-source operating system QubesOS extremely secure. Therefore, Joanna Rutkowska does not offer a general security solutions are sold, but with the right answer to the question. For example, how to surfing every day in cyberspace safely? Thus, you should try to own and use a variety of tools for different tasks. “I use the iPad for surfing and computers backed up to work,” says Joanna. However, it is no longer required when using QubesOS. “Maybe a few more years I can tell you, for those who want a secure computer, you only need to use QubesOS” added Joanna little promotion. He is a tireless fighter for freeware applications. Not only that, he did not consider himself to security experts, but he relentlessly warn people about the dangers of computer. “For me the best example is Windows because it has monitoring functions, digital cuffs for user files, and security holes,” said Stallman warned. Therefore, he recommends using freeware software which no longer free to spy on users. Each time Stephen Pao hiring a new employee, co-founder of Barracuda Networks WLAN is always keep an eye in the company. 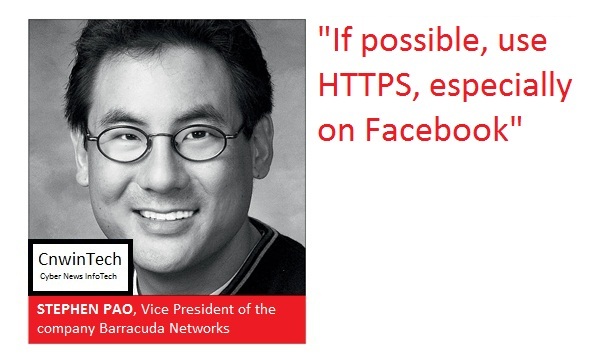 If these new employees brave to log on Facebook without HTTPS protection, hacker software Firesheep Pao’s will turn on alarm. Without HTTPS, usually Data sent without any encryption between website and PC. In an open WLAN, it is an invitation for hackers. On Facebook, its setting option at “Account Settings | Securit | Secure Browsing“. If you have not already, please do. The same function is also offered many other web services. Due to already believed to their friends, without thinking Candid Wuest meets the friend request. However, Candid surprised by things he found in his friend flash disk? A vicious USB autorun worm that exist in flash disk. Ultimately, the worm can be active when the flash disk is inserted in a USB slot. Furthermore, the Worm can directly infect the test system’s Candid Wuest. “I have to reinstall all the computers,” he said. An error due to lack of caution which is not easy to avoid this Symantec experts. 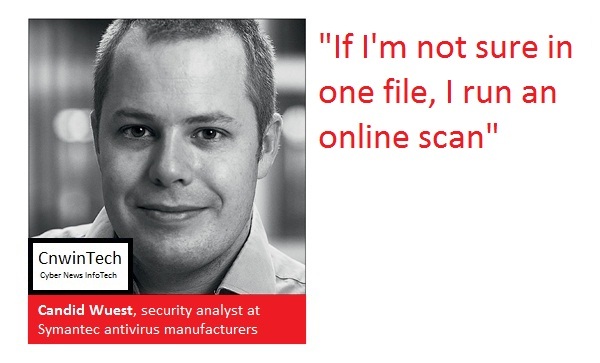 Because not all programs recognize the security of any virus, online scan actually can help it. Virustotal.com web service instance can check files with assistance of more than 40 different virus scanner applications. 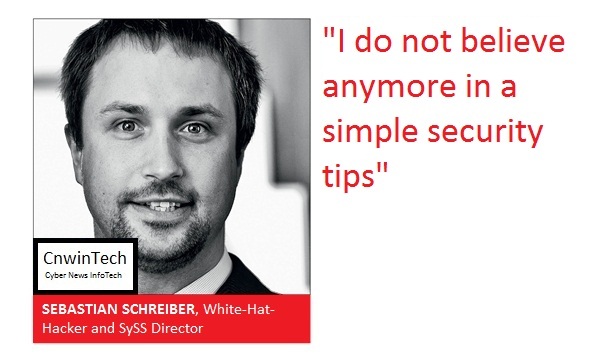 As request of company, Sebastian Schreiber had infiltrated into network as testers. However, he even panic when installing an application, but he forget the code. By doing a simple trick, still he did not succeed. Currently, simple tips and tricks are actually outdated. To protect your computer, you must take care with difficulty, making it vulnerable to dangers, and should be careful on Internet. Tips from Sebastian, if an expert promise a simple solution, always be skeptical because the experts themselves are not free from error.